The closest I ever get to sowing seeds is laying down grass seed to fill in the gaps in the lawn. I can’t say I have any expertise in this, or much success, but I try. When I sow the grass seed, I try my best to get the soil just right. I go to the store, pick up top soil or even planting mix. I dig out the weeds and rocks, and put down a layer of that specially prepared soil. I try to buy grass seed designed to sprout quickly and has a long life span, though it rarely works as promised. As Cheryl can attest, I do what I can to make the front yard look nice, but I confess that I don’t have a green thumb. Jesus lived in an agrarian world, and so he often turned to agricultural illustrations to describe the reign of God. The people with ears to hear, understood his message. We live in a very different world than Jesus did, so maybe, if Jesus was walking around in our time and telling stories for our ears, he might tell a story about computers, the internet, and the viruses and hackers who try to corrupt our computers and steal our identities. Jesus might talk about the links in emails that claim to be from friends, and which, if we click on them, might give hackers access to our computers and more. He might say that if you want to be ready to receive the good news of God’s realm, you might want to get a good anti-virus program. In the meantime, we can use our imaginations so we can hear this word about the realm of God. The parable begins with a farmer going out to scatter seed. In this story the farmer scatters the seed with reckless abandon. This farmer doesn’t go out and prepare the field by digging out the rocks and pulling the weeds. In fact, this farmer doesn’t even care if the seed falls on the hardened pathway. While the birds might appreciate this farmer’s willingness to throw seed upon the path, no plants will emerge from those seeds. The farmer doesn’t seem to care that seed lands in rocky ground, where the soil is shallow and the plants can’t put down deep roots. So, when the sun comes up, they wither and die. Since the farmer didn’t pull out the weeds, when the seed falls in with the weeds, the plant gets choked out. You might say that this farmer is rather careless. Fortunately, some of the seed falls on good soil, sprouts, puts down deep roots, and produces a great harvest. Preachers like me often read this and see ourselves as the farmer. We may take some comfort in the idea that success isn’t in our hands. As Richard Lischer puts it: “The preacher puts it out there, unsure of who is listening and who is not, unable to calibrate the sermon to its ‘target audience,’ and never able to predict its outcome” (Reading the Parables, p. 49). Of course, there are other ways of looking at the task of preaching, that read the parable differently. But maybe this isn’t a message about preaching, or even evangelism and church growth. Maybe this is about God and the way in which God works in our lives. If God is the farmer who sows the word in our midst, then the question is, are we open to receive that word, which God scatters and sows with seeming abandonment, letting it fall where it may? This past week a number of us from the congregation went down to Indianapolis for the General Assembly. We all heard words spoken. Seed was scattered and sown. Each of us received that seed differently. At least, we all have different stories to tell about the seed and how it landed in our lives. I’ve not talked with anyone, except Cheryl, since our return from the Assembly. So I can’t speak for anyone else. You will need to speak to them to hear what they experienced. 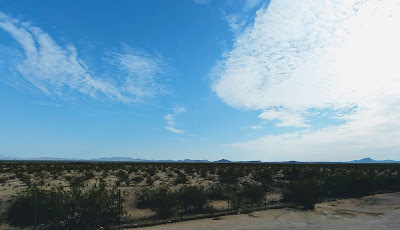 I’ve posted some initial thoughts on my blog, and I will be sharing more thoughts in the coming days. I did bring home a couple of DVDs, including the sermon given Wednesday evening by our new General Minister and President, the Rev. Dr. Teresa Hord Owens. As I shared in my blog post, I have had the privilege to participate in the election of both Sharon Watkins and Terri Hord Owens. Both of these elections have been historic moments. Sharon was the first woman to head a Mainline Protestant denomination, while Terri is the first African-American woman to head a Mainline Protestant denomination. 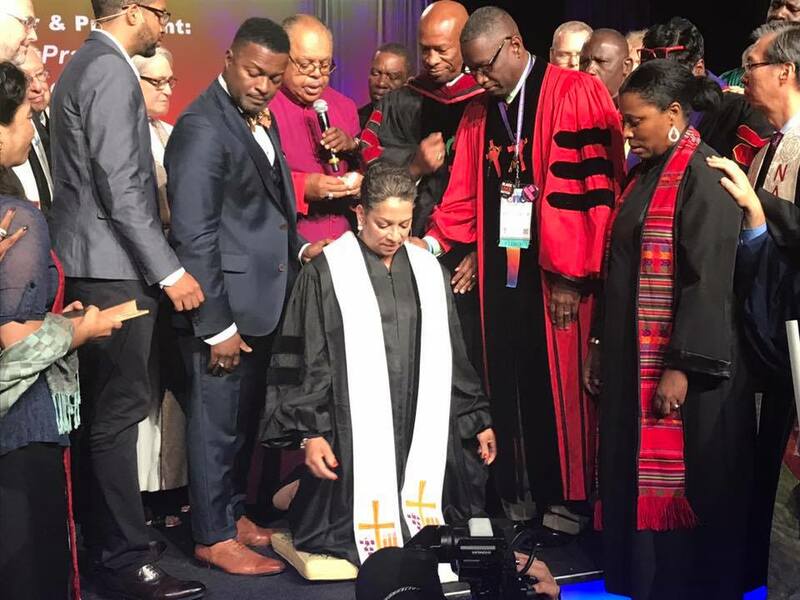 After we helped install Terri Hord Owens to this new position of leadership through prayer and laying on of hands, we heard a word to the church. Our new General Minister and President cast a vision for the church as it enters a new phase of its life under her leadership. One of the words I heard was a strong call to ground our life together theologically and biblically. She invited us to move beyond simply rooting our life and work in proof-texts to truly engaging in the study of the Bible. She also told us "This is not a solo gig. This is the work of the whole church together." Then she invited us to join “Team Disciples.” A word was sown, but will we hear, and will it bear fruit in our lives? Only time will tell. 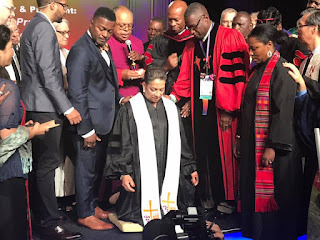 As I reflected on my time in Indianapolis, and the way in which God was moving in my own life, perhaps the most poignant moment came on Sunday morning. Cheryl and I were planning on going to hear a friend preach, but the promised transportation never seemed to arrive. With the morning quickly passing us by, we decided to get on a bus and go where it took us. When we looked up the church, we discovered that this is where another friend was preaching. So, we got on this bus that took us to a small church, where normally about fifteen people worships. The preacher of the day had once served this church as its student pastor, and she had asked if she might preach to them. The current pastor got a school bus, and came and picked up a bus load of Assembly-goers. Most of us were friends of this preacher, who now serves the church Cheryl grew up in. This congregation welcomed us with coffee and donuts and then fed us a fried chicken for lunch. In between the donuts and the fried chicken, both of which tasted good, Maria sowed a word from God. She spoke a word about letting go of the things that bind us and keep us from experiencing God’s presence and work in our lives. She spoke of trusting our lives to God’s hands. You and I know how difficult that is, but on that morning, when I had made plans for the day, things worked out differently, and you know what? I experienced a powerful moment with God. In that moment as Cheryl and I sat there in that pew, listening to the sermon, I was reminded that God works in mysterious ways, and speaks to us in places where we might not expect. This wasn’t a big church with professional worship leadership, but God spoke. Seed was sown. I was touched. I enjoyed the Assembly. I got to hear good preaching, meet up with old friends, and make new friends. But the most powerful word, the one that took the deepest root, came on Sunday morning in that little church that welcomed us into their midst, and allowed us to hear a word of grace and peace from Maria. I’m glad that somehow Cheryl had the ears to hear, so I might hear that word as well. While I know that it’s wise to make the soil ready to receive the seed, so it can bear fruit, it is good to remember that God isn’t limited to well-plowed fields. God’s grace can reach us no matter where we are residing. It’s good to remember that God’s word doesn’t have to be protected or hoarded, because God’s love and grace are abundant. That means that God isn’t afraid of wasting seed on seemingly unproductive soil. While not everyone has ears to hear, it’s not up to us to decide who gets to hear or when and where they get to hear God’s word of grace and salvation. We can and should scatter the seed of God’s word of love, grace, mercy, and peace with abandon. We can join together in the Spirit and pursue the work of reconciliation in a world that experiences brokenness and fragmentation. So, may our hearts be ready to receive this word that God scatters with abandon, so that when it falls on our hearts it might take root and bear fruit. Picture Attribution: Tissot, James Jacques Joseph, 1836-1902. Sower, from Art in the Christian Tradition, a project of the Vanderbilt Divinity Library, Nashville, TN. http://diglib.library.vanderbilt.edu/act-imagelink.pl?RC=55004 [retrieved July 15, 2017]. 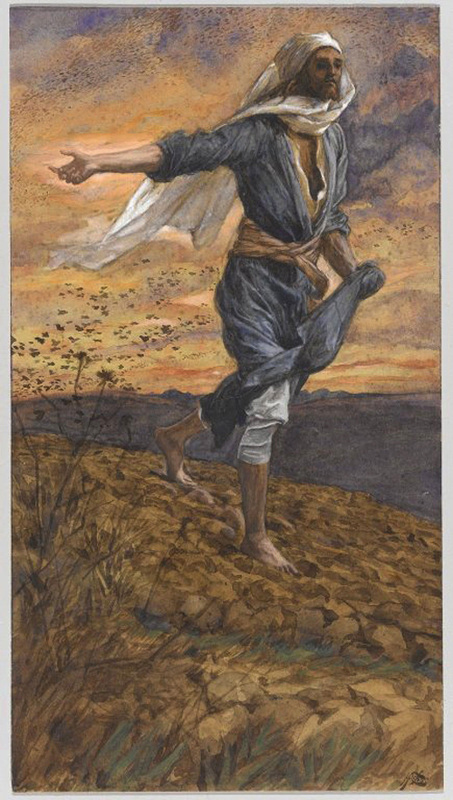 Original source: http://commons.wikimedia.org/wiki/File:Brooklyn_Museum_-_The_Sower_(Le_semeur)_-_James_Tissot_-_overall.jpg.